The current radar map for Feb. 1, courtesy of Weather Underground. SUSSEX COUNTY, NJ – Snowy weather is expected once again to blanket the area beginning on Sunday night, Feb. 1, with a Winter Storm Warning in effect starting at 7 p.m.
A Winter Storm Warning signifies that significant snowfall, sleet and ice can occur during a weather event, creating hazardous travel conditions. 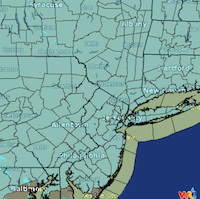 Throughout Northern New Jersey and New York City, snowfall is expected during that time at six to 12 inches, with three to six inches in Central New Jersey and one to three inches more south of that in the Trenton area. The storm is anticipated to make its way into the area in the evening, then continuing throughout the night and heavy into Monday. Sleet and freezing rain may mix in to the morning commute, making for a messy ride for those who may be traveling. Temperatures will be in the 20s, with teens and single digits during the daytime on Monday. Chance of snow is predicted for this area at 100 percent, as well as through Monday, with precipitation tapering off on Monday night. On Tuesday night, the weather is forecasted to be partly sunny and cold, and on Wednesday and Thursday, the potential of more light snow to move in is expected at 50 percent. 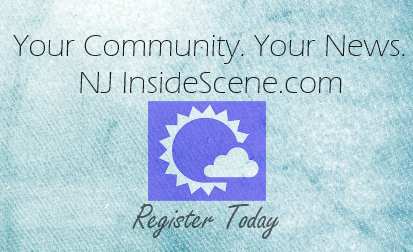 NJInsideScene.com will continue to track the storm and provide information on the Facebook Page about delays, closings and cancellations. Click here to like our Facebook Page.